Solve puzzles to activate problem solving skills. Brain teasers are unique in that they activate different forms of problem solving skills. 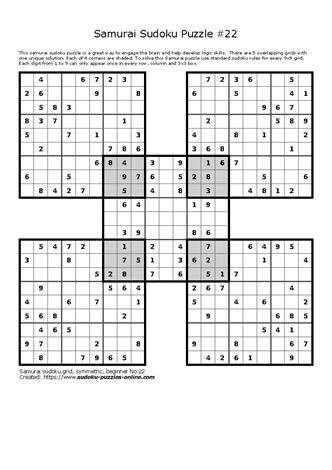 The uniqueness of Samurai Sudoku puzzles is that they require logic and applying basic Sudoku rules in order to solve the puzzle. This beginner rated brain teaser is made using 5 interconnected 9x9 grids. The shaded areas are intended to draw attention to the common 3x3 grids shared between two puzzles. Work with family and/or friends to solve this puzzle to see how long it takes to complete the challenge.